Happy sunny Tuesday :-) I don't know about you but I could certainly get used to this gorgeous heat & sunny days! So today is 'treat Tuesday' as I'm taking a couple of hours off work to meet up with some girlfriends & sample afternoon tea in a new tearoom that's recently opened in the next village & I can't wait - fun laughter, finger sandwiches, cake & scones.....what more could a girl ask for?!! 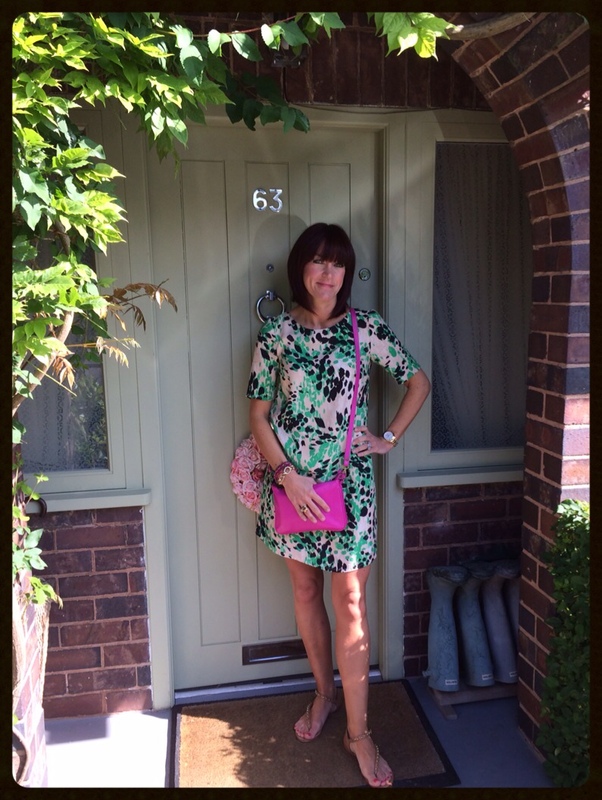 So in honour of the sun & a couple of hours off work I'm breaking out my ASOS 'Bet' dress & mixing things up with my shocking pink Boden bag. Have a great day....can't believe it's Wednesday tomorrow already - whoop whoop!!! I just discovered your blog recently and I'm really enjoying it. Having let myself go a bit in recent years, I am now feeling motivated to make a bit more of an effort. In the last few days I have taken a bit more care over my make up and added accessories when I wouldn't normally bother. Just little things that no-one else would even notice but make a difference to me. Planning a bit of a shopping spree in the next few weeks too! Hi Kirsty thanks for commenting & you're right it's all about how it makes you feel not whether anyone else notices. Happy shopping spree....you've chosen a great time with all the sales! Enjoy. What a fab dress Jane, I love it! The sun has gone here in Berks but it has been so good for so long lately. Thanks Fiona, think the weather is due to change here to....oh well it was good while it lasted & hopefully it won't be long before its back!! Thanks Helen...the dog was out of shot enjoying the sunshine lol!! So pretty! The colours look lovely on you. Thanks Abbi, I love this shade of green.